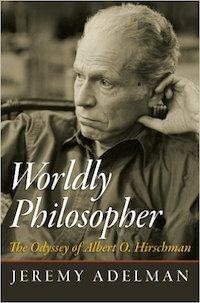 Worldly Philosopher chronicles the times and writings of Albert O. Hirschman, one of the twentieth century's most original and provocative thinkers. In this gripping biography, Jeremy Adelman tells the story of a man shaped by modern horrors and hopes, a worldly intellectual who fought for and wrote in defense of the values of tolerance and change. Born in Berlin in 1915, Hirschman grew up amid the promise and turmoil of the Weimar era, but fled Germany when the Nazis seized power in 1933. Amid hardship and personal tragedy, he volunteered to fight against the fascists in Spain and helped many of Europe's leading artists and intellectuals escape to America after France fell to Hitler. His intellectual career led him to Paris, London, and Trieste, and to academic appointments at Columbia, Harvard, and the Institute for Advanced Study in Princeton. He was an influential adviser to governments in the United States, Latin America, and Europe, as well as major foundations and the World Bank. Along the way, he wrote some of the most innovative and important books in economics, the social sciences, and the history of ideas. Throughout, he remained committed to his belief that reform is possible, even in the darkest of times. This is the first major account of Hirschman's remarkable life, and a tale of the twentieth century as seen through the story of an astute and passionate observer. Adelman's riveting narrative traces how Hirschman's personal experiences shaped his unique intellectual perspective, and how his enduring legacy is one of hope, open-mindedness, and practical idealism.